This construction is a classic example of Merz, an art form invented by Kurt Schwitters that included collage, poetry, graphic design, and sculpture. Schwitters adopted the name from a 1918 assemblage that included the fragment “merz” excerpted from a poster for the Commerz und Privatbank (Commercial and Private Bank). His brightly colored collages and assemblages celebrate the potential of leftover materials while blurring the boundary between art and life. This engaging object appears to be a cross between a Cubist collage, a wall clock, and a kindergarten project. It hangs on the wall with an undeniable dignity that transforms its humble scraps of wood, metal, cardboard, and wire into the proud raw material of abstract art. The formal structure of Schwitters's Merz compositions derives from his subtle layering of texture and color and careful syncopation of shapes and planar segments. A persuasive sense of mechanical potential arises from the interrelated workings of its components: the gray knob with its tip painted red, the gearlike discs, and the marvelous wedge in the upper left ready to kick into action. The bright blue, pink, yellow, and red proclaim its maker's delight in the creative potential of society's discards and leftovers. This construction is a classic example of Merz, an art form invented by and unique to Schwitters. It came to include not only collage and assemblage but poetry, graphic design, and sculpture. Schwitters adopted the name from a 1918 assemblage that included the typographic fragment "merz," excerpted from a poster for the "Commerz und Privatbank." He later explained that Merz "denotes essentially the combination of all conceivable materials for artistic purposes. . .. The artist creates through the choice, distribution and metamorphosis of the materials. 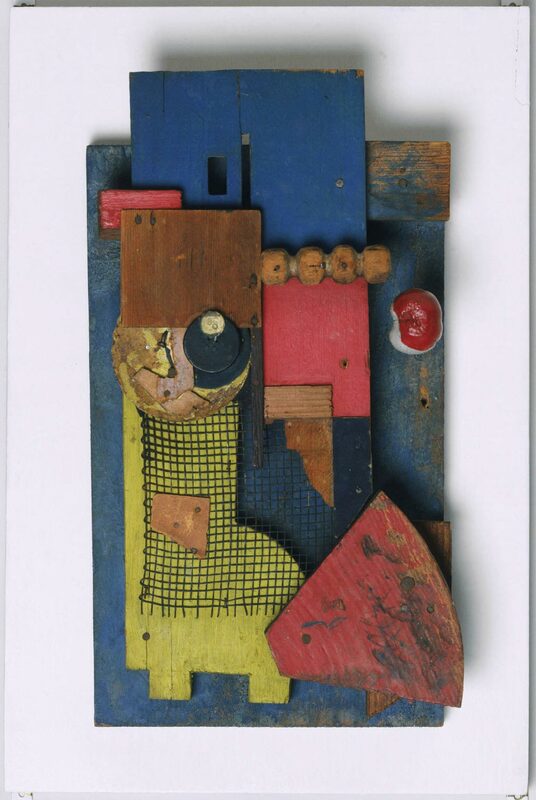 "1 Schwitters's nature was that of an inveterate forager and he had a genuine fondness for all sorts of odds and ends. But he also had an ideological commitment to Merz: a desire to erase the opposition between the realm of art and the ordinariness of daily life. Like other artists associated with the Dada movement, Schwitters was often mistakenly condemned as an attacker of art. In reality he offered it fresh life, inventing a world of new materials and formats that would inspire future artists ranging from Robert Rauschenberg to Gabriel Orozco. Twentieth Century Painting and Sculpture in the Philadelphia Museum of Art (2000), p. 60. 1) Kurt Schwitters, "Die Merzmalerei," Der Sturm, vol. 10, no. 4 (July 1919), p. 61; quoted in Kurt Schwitters, by John Elderfield (London: Thames & Hudson, 1985), p. 50. A. E. Gallatin, New York, by March 1936, probably purchased from the artist during the summer of 1935 through Jean (Hans) Arp ; bequest to PMA, 1952. 1. The work appears in the MoMA exhibition catalogue, "Cubism and Abstract Art," published April 1936, as a loan from Gallatin. According to Jean Hélion, "it was through Jean (Hans) Arp that Gallatin got in touch with Schwitters" (Gail Stavitsky, interview with Hélion, 1986, quoted in The Development, Institutionalization, and Impact of the A.E. Gallatin Collection of Modern Art [Ph. D. dissertation, New York University], 1990, v. 1, p. 289, see also v. 9, p. 269).